Tips: -The picture here shows what it looks like with additional broth; add more at will. -The beef browning process is a little flawed. If you aren't particular about a sear on the outside of the pieces, then proceed as directed. -Salt isn't an ingredient, but you must add it, to your liking. Credit goes to the Nesco 18-Qt. Roaster Oven Recipe Collection. Preheat Roaster Oven to 450°F. Place butter in preheated Cookwell to melt butter. Combine flour and pepper; dredge meat. Place meat in Cookwell; stir. Cover, cook meat 15 to 20 minutes or until browned. Add vegetables and cover, reducing temperature to 250°F. 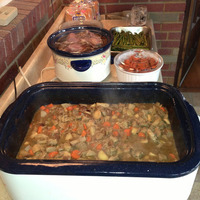 Slow cook 1-1/2 to 2 hours or until meat and vegetables are tender. Add half the broth and Worcestershire sauce. Combine remaining broth and cornstarch; whisk until smooth, and stir into stew. Cover; slow cook 30 minutes or until thickened, stirring once. I find this an interesting recipe to try. Hello, ShaleeDP! I'm honored to hear from you. We make this recipe just about every year. It's a lot of chopping, but it's worth the effort because it feeds a crowd. Let me know if you try it! Best regards to you. Joy of Cooking's Peach Pie I.